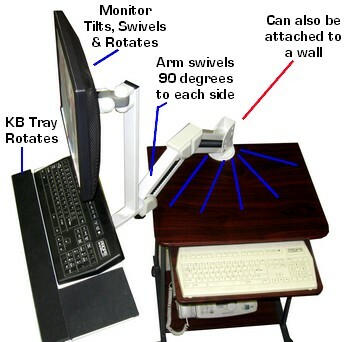 Set up an extendable standing computer workstation on a table or install a sitting OR standing workstation on a wall. a) Desk installation: the keyboard will be 10" above the tabletop. Therefore, we suggest this mostly for stand-up operation. 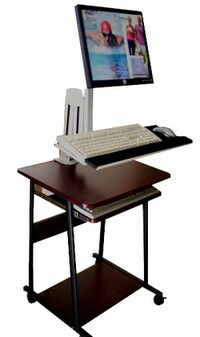 This is an easy way to create a portable stand up workstation when installed on a compact portable computer desk. The LCD monitor / keyboard combo always extends 100% parallel to the floor. 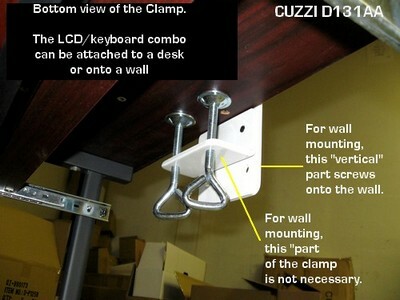 It extends from 22 to 37" (distance between rear of the clamp -or wall- to the front of the keyboard). The height is not adjustable. 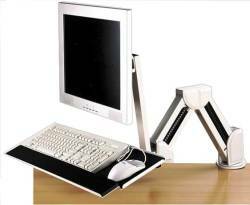 The LCD monitor can tilt, swivel & rotate. The keyboard tray is fixed at a set angle related to the LCD. b) Wall installation: when mounted to a wall, it can be installed for EITHER sitting OR standing operation, but not both, as the LCD/keyboard combo is not height adjustable. Please call us before ordering to see if this item will be applicable to your installation project. Important / Wall Mounting: make sure the wall can support the product weight (25 lbs.) plus your LCD + keyboard and the movement of the arm. Install only with fasteners applicable to the wall characteristics, preferably on studs. 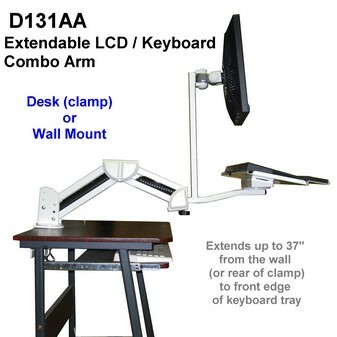 - LCD/keyboard extension range from the clamp's rear end (or wall): from 22" to 37"
- LCD Height: 23" from clamp base to center of LCD bracket. - LCD mount: VESA compatible 75 x 75 and 100 x 100 mm. - Keyboard w/foam pad for mouse and wrists. - Clamp opening: from 2.25 to 5"
- Ideal "overhang" for clamp to fully secure to the edge: 3"
* Product Weight: 25 lbs. (w/o LCD monitor & keyboard).